GSEB HSC Time Table 2019 Download – Gujarat Board 12th class General/Science Exam Date Sheet March 2019 is available at www.gseb.org. The Gujarat Board of Secondary Education (GSEB) HSC Date Sheet 2019 is released. According to the schedule the HSC science examination will begin March 7 and will end on March 16. The HSC general stream examination will end March 23. The first paper of all HSC streams science and general will begin on March 7.
hsc timetable 2019 commerce, science, general: Gujarat Board of Secondary Education (GSEB) is the state level education board monitors secondary and higher secondary education in the state. The GSEB Board conducts classes and examinations for students every year. The GSEB striving to offer quality education for the students. This board is functioning since 1960 in the education sector. Every year millions of students obtaining their certification from this board. The Gujarat Board annually conducts the SSC and HSC examinations in March/April months and releases the results in May month. Students presently studying the Intermediate/HSC in the state of Gujarat can download from official website. GSEB HSC Date Sheet 2019 for both first and second years will be released at a time. Students obtaining the education in various colleges of Gujarat can check the GSEB class 12 Date Sheet 2019 PDF from the GSEB Official website, gseb.org. students pursuing in various branches such as Maths/Science/Arts can check the date sheet. Same like every year, the GSEB Intermediate examinations will be held in March/April months. Wait till the exact dates announced by the board. Keep visiting the GSEB website for latest updates regarding GSEB HSC Exam dates 2019. Last year the Gujarat 12th class examinations were held during 15th March to 27th March for 1st and 2nd years while the Gujarat HSC time table was released in December month. Students have to go through the exam dates, timings keenly once after the date sheet has been released. The Gujarat Board announces the exam dates, timings of theory and practical exams. Students can check the time table clearly from the official website, gseb.org and can also take printout for further reference purpose. 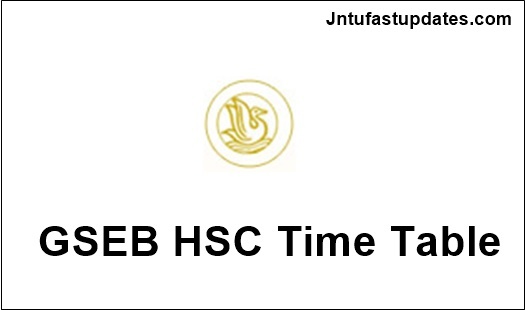 On the homepage, GSEB HSC Time Table 2019 Link appears; Click on the Link.